Day +91: While our hearts still mourn the loss of Abigail yesterday, we wanted to update you on Kiira. She had what will most likely be her last physical and feeding therapy on Monday. She got to go on her first swing in physical therapy, but she wasn’t sure what to think of it. We will miss Niki and Kristen so much as they’ve become a part of our weekly lives and helped Kiira immensely. Kiira also had her last central line bandage change, as long as all goes as planned to remove it on Monday. So exciting! She had an eye exam and hated having her eyes dilated but the doctors did a great job with her, as all the doctors here have. Kiira has a slight astigmatism. It’s likely that it will go away with age, but could get worse, so they’ll keep an eye on that. Eye problems, usually due to frequent corneal abrasions, are very common with EB. Kiira has never had a corneal abrasion, but they’re painful, and can cause eye damage, so we hope to avoid them if at all possible. Yesterday we went in for labs, but don’t have the results of those yet. The staff told me they heard rumors of us heading home, so it feels more of a real possibility. We have an appointment on Friday with Dr. Tolar. It’s been awhile since I’ve seen him, so I look forward to it. As for an update on our apartment, they told us again that we have to pay through November, unless they get it rented out early. By coincidence (or God), our cousin has a connection with the owners so we are trying to get their help with this rule. In the meantime we are also trying to go from the bottom up, so hopefully someone in the chain will excuse us from the November payment. Today my mom and I took the girls for one last trip to the Mall of America and Jason enjoyed his day with Kiira. We ran out of some of our bandages since we got here early, didn’t get bandages in the hospital, and had to go up in sizes. Thankfully Kiira hasn’t had many injuries in several days, so it buys us time while we wait for them. We have a ton in California, but we didn’t pack enough for here. Yesterday we saw Kiira sign “thank you” for the first time, so we captured it on video. It’s so adorable to see her communicate more and more. Please pray for Abigail’s family as they prepare for her funeral this Saturday. I know they can use help with medical bills and funeral expenses, so if you feel moved to do so, you can access the gofundme link on her Facebook page Prayers For Abigail Updates. Day +84: I want to clarify our recent posts. 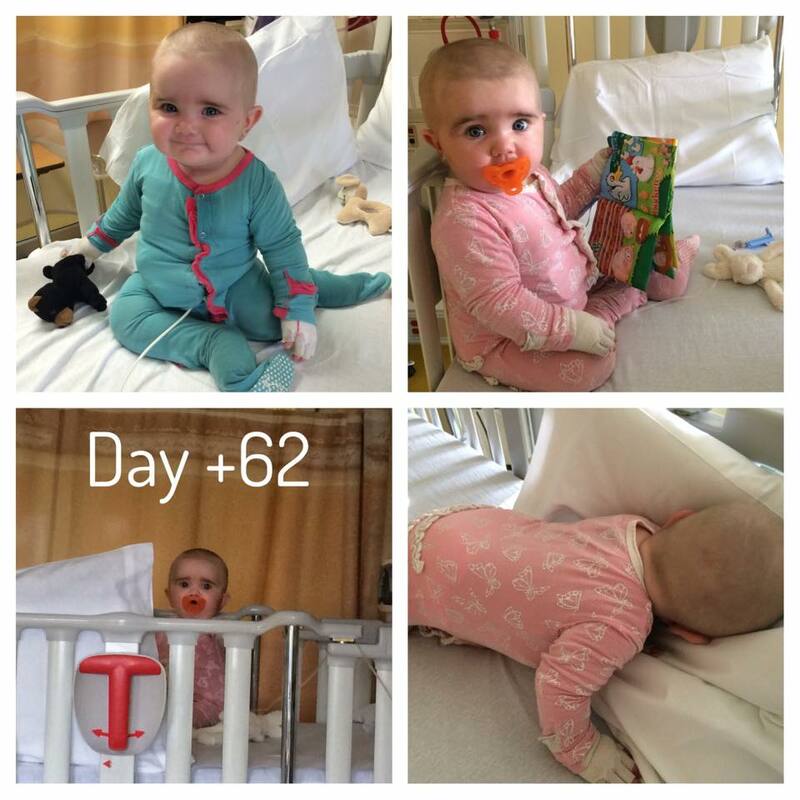 Epstein Barr Virus (EBV) came up as a result of Kiira’s lowered immune system due to the chemo and radiation. It’s a common virus but very serious in immunocompromised people. We are so thankful that it only took one treatment and aside from a little nausea, Kiira didn’t seem impacted by the virus or treatment. We hope it continues to stay away because it can cause her to lose her transplant. Kiira still has Recessive Dystrophic Epidermolysis Bullosa (EB). The bone marrow transplant will never take that away as it’s a part of her DNA. The hope is that the donor cells will help her make Collagen VII so that her skin will be tougher–less blistering and faster healing. However the full benefits of the transplant can take years. It does seem that Kiira’s skin is getting a bit tougher. Crawling takes its toll because of so much friction, but we see other little changes–we tried a normal onsie on her today. 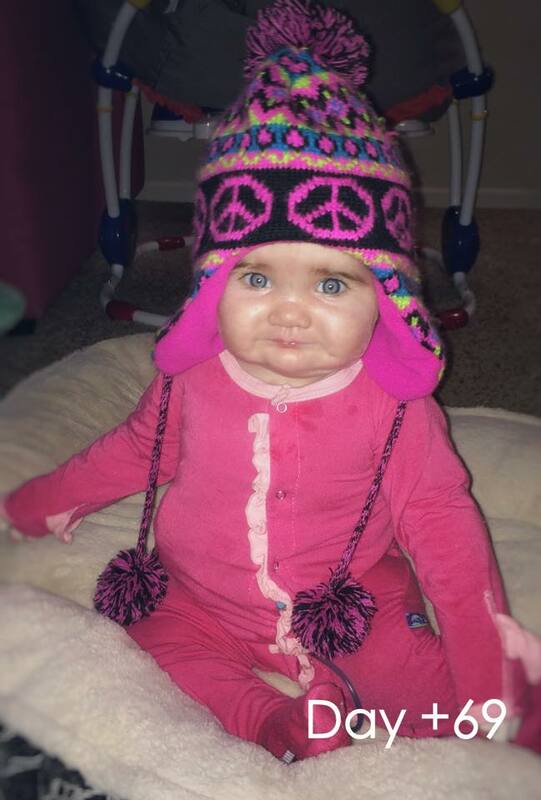 As a newborn, the seams were enough to cause blisters, but with these normal clothes, she had no issues. On the other hand, she fell on the hardwood and tore the skin on her forehead a few days ago and today fell against my leg and I had soft leggings on, but it was enough to tear the skin off her cheek. Also now when she gets hurt or a blister, she cries, which she didn’t usually do until recently. So she still very much has EB, and we hope her skin will get stronger as time goes on. There is no way I could put her in a normal day care or class at church or have just anyone care for her. She still requires delicate handling, but we’ve come so far from the days where we would only touch her with aquaphor on our hands or carry her around on a pillow. And I’m so thankful for that. It was such a joy to see Kiira in the video that The Butterfly Fund put together (see previous post). This organization and so many people have showed us an outpouring of love that we could never repay. Thank you! I am fighting a bit of a cold and I think the girls already had it (even Kiira had a bit of a runny nose), but please pray that it doesn’t affect her any further. Thank you and God bless you for following Kiira’s story! 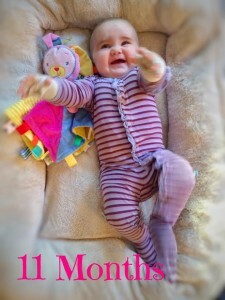 Day +73: Today Kiira is 11 Months old. With bandages and clothes, she weighs 21lbs and is about 28″ long. She doesn’t eat or drink, but she says her versions of mama, dada, up, ball, and diaper. She dances whenever music comes on and keeps trying to pull up on furniture. 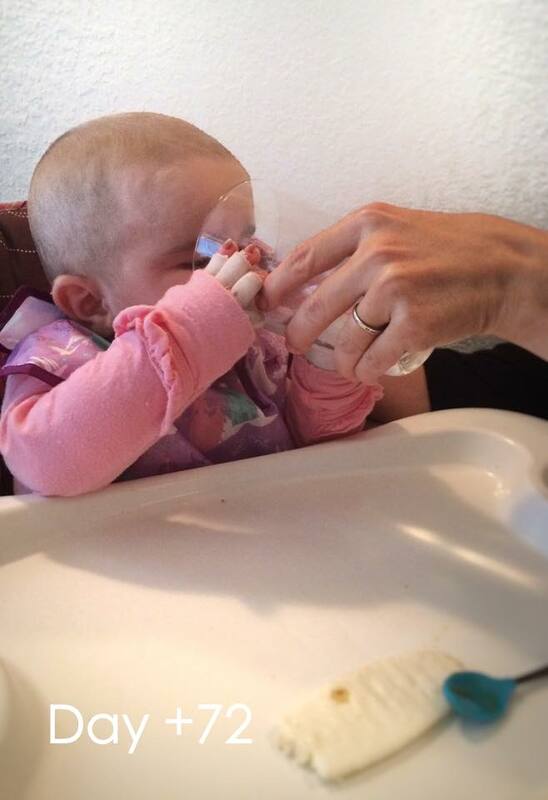 She isn’t strong enough to do it on her own yet, but she is getting stronger every day. While we are trying to keep her from getting sick, she likes to crawl to the shoes and put them in her mouth. She can turn the Xbox on and off, take selfies on the phone, and loves to play with her sisters. It’s so cute to watch her follow them around. She is easily entertained and loves to laugh, but has a temper too. She does not want to be held in place for bandages or diaper changes. Thank goodness for her pacifier, music, and distracting toys. Day +72: Although overall the clinic appointment today was uneventful, we found out Kiira’s Epstein-Barr Virus (EBV) numbers are back up. This virus is very serious for bone marrow transplant patients and they’ve been watching it closely. I was so excited last week when it nearly disappeared on its own. Kiira still has no symptoms, but since it came back, they are planning to treat it with one dose of Rituximab, which will hopefully knock it out for good. I don’t know any details about when it will take place or what to expect. Once again, she acts like nothing is happening to her, and is as happy as can be, except when we hold her down for gtube feedings and bandages, because she just wants to go, go, go. We had hoped to visit Lake Superior in the next couple of weeks, but Kiira’s doctors gave us a list of reasons why she shouldn’t go. A cabin is dirty, the forest is full of spores and bacteria, too far from the hospital… I’m not sure how this will advice will impact our plans to drive home with her in potentially 30ish days, but it made me realize that even though she is doing well, we have to be so careful not to jeopardize that. I also have been spending time researching new clothes (something other than footies) and shoes for Kiira. I have no idea what will work over her bandages, but nothing is simple with EB and now a low immune system to consider when making plans. While Kiira still won’t eat, she loved drinking from my cup, so maybe we’re skipping all the baby stuff and jumping to “big girl cups” as my girls call it. Please pray that the EBV will go away and not affect Kiira at all. Also, I received news that a friend’s baby passed away unexpectedly today (not EB related). No matter the reason, it is impossible to understand why. Please say a prayer for this family tonight. 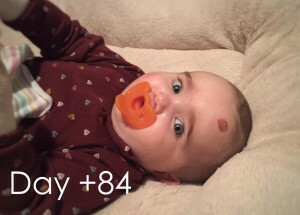 Day +69: Kiira had clinic today and good news–all of her numbers are coming up on their own now that the EBV is gone, so she didn’t need any transfusions. WBC: increased from 3.7, but we don’t have today’s number. These results are all an answer to our prayers and although they can go up and down, we hope they continue to increase to normal levels. Plus, today we had no blisters to pop; any day without blisters is a great day! We hope to see many more days like this now that we are further out from transplant. We were supposed to drop down to going to clinic once a week, but we actually have to go in every day this week for something. As inconvenient as that might be, I can’t complain because Kiira is doing great! I try to keep up with other families on this journey and today we learned Rally for Raul is heading here on Sunday to start his BMT process. There are still many others suffering greatly from EB and even the BMT process. Please keep them in your prayers, along with Kiira (although God deserves a lot of praise too). 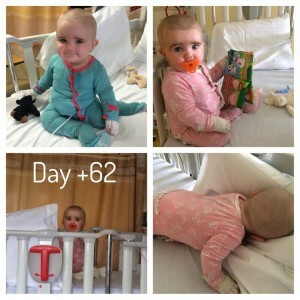 Day +62: Kiira had an IVIG infusion today. We started the day with a quick visit to the moms of Anton and Abigail and then we were stuck in the infusion room for the next 4 hours. I think it’s my fault, but Kiira threw up before we even started, so she got a sponge bath, clean outfit and bedding and then we finally started the infusion. She was sleepy from the Benadryl but was so busy crawling around and pulling up on her knees on the crib that she only slept about 15 minutes. She did great and she took a long nap when we got home while we worked and took the girls to the pool. Today we also said goodbye to Love for Baby Catt. They’re just starting their journey and waiting for approval to get a BMT. They also brought Kiira a fun new toy, along with new gloves and tights that our insurance won’t cover. Thank you! We will have more updates on Friday about Kiira’s BMT numbers. Praying the engraftment is high and Epstein-Barr Virus (EBV) numbers are undetectable!